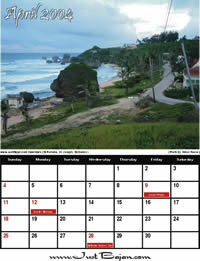 Welcome to the JustBajan "Calendar Downloads" section. Here you will find monthly calendars that you can download and print. Hang them up at home, hang them up at work, give them to friends or even email them. All you need to view a calendar is Adobe Acrobat Reader. If you don't have it, don't worry, its free software. Just click on the "Get Acrobat Reader" logo below to download the latest version of Adobe Acrobat Reader.